MITAS a.s is one of Europe’s leading producers of agricultural tyres. MITAS a.s. is a member of ČGS HOLDING a.s. and operates three production plants in the Czech Republic, one in Serbia and one in the USA. Mitas manufactures and sells tyres under three brand names: the company’s own Mitas and Cultor, and Continental under licence. Their products include, in particular, tyres for all types and sizes of construction machinery, for excavators and loaders, trucks and lorries, multipurpose machines and motorcycle tyres. 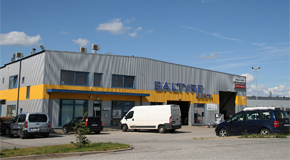 Mitas tyres importer and seller of Estonia is Baltyre Eesti AS.